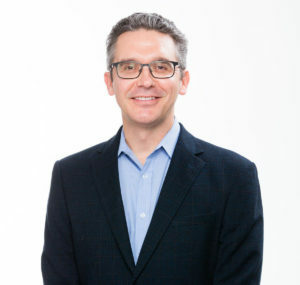 Ben Carlson who blogs at A Wealth of Common Sense has made a big impression on the investment blogosphere in a short amount of time. 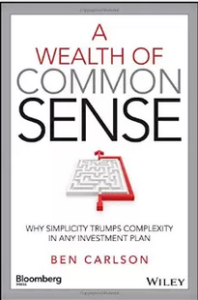 It isn’t surprising that book publishers wanted to get him to put his thoughts and insights into a longer form which he has in A Wealth of Common Sense: Why Simplicity Trumps Complexity in Any Investment Plan. Ben has been making the rounds in support of his book including podcasts with James Osborne and Nate Geraci. Michael Batnick at The Irrelevant Investor pulled ten of his favorite quotes from the book and Patrick O’Shaughnessy at Investor’s Field Guide had a chance to ask Ben some questions about his personal investment philosophy. Ben also had a chance to write about a post about ten things he learned while writing the book. AR: You talk in the book about investors getting trapped “in the middle ground” between strategies. Which I think accurately describes how investors get consistently get off track. How can investors avoid the temptation to try and grab a hold of that hot, new strategy? BC: There will always be a constant stream of new products and fad investment ideas. The best way to avoid playing hot potato with your portfolio is to have a good idea about what you won’t invest in. If you restrict your investment universe to only those products and strategies that you have a solid understanding of you can save yourself a lot of unnecessary time and effort. AR: Why do individual investors think institutional investors have it better? Taxes aside, it seems that institutional investors have a lot of handicaps that make their jobs tougher. BC: I think people see the large research budgets, access to top money managers and the ability to travel to meet with different portfolio managers as an advantage on the institutional side. But with all of that comes a lot of pressure to perform. Institutional investors are expected to outperform the markets and their internal benchmarks and the time horizon in which these investors are being judged continues to shorten. Not only are professional investors measured against the market and their benchmarks, but there are also peer comparisons that come into play as pensions measure themselves against other pensions or endowments compare themselves to other endowments. Therefore, career risk is magnified and the what-have-you-done-for-me-lately line of thinking is always in play. The competition is intense. AR: You have a whole chapter on the use, and mostly abuse, of market data. If an analyst can come up with data to support nearly any conclusion, is there any value in historical analysis? BC: I do think that an understanding of market history is important for any investor, but it’s more important from a risk perspective than a return perspective. Looking at history allows investors to view the cyclical nature of the markets and the fact that there are times when investor psychology goes to extremes, either through unsustainable highs or unsustainable lows at the points of maximum optimism or pessimism. I don’t think you can accurately predict future returns based on the past, but you can get a better sense of the potential risks that exist. AR: You discuss the need for investors to have a written investment philosophy, which makes a great deal of sense. At best most investors have some tactics they follow, let alone a cohesive investment strategy. Do you have some guidelines investors can use to make drafting an investment philosophy easier? BC: It can be as simple as a one page document that lists your beliefs on the markets and what constitutes a legitimate investment process. A good start for most investors would be to outline the strategy or strategies they’re comfortable investing in along with those to avoid. Your philosophy should help you narrow down the type of investment process that’s compatible with your personality. One of the biggest mistakes I see average investors make trying to invest in a manner that doesn’t suit their personality. Your philosophy should take into account your unique situation and attributes. AR: You note two big problems with active management. First the difficulty in selecting winning active managers and second getting the timing right. Given those challenges is it worth the bother? BC: The line between index and active funds is getting blurred by the increase in factor funds that are available, so I think it all depends on how complex investors would like to make their portfolios. But investors need to ask themselves not only ‘Can I pick the winning active managers?’ but ‘Do I need to?’ I think not enough investors look at their overall plan and determine whether or not beating the market should be one of their goals and is it worth the time, effort and higher fees. I’m not saying it’s impossible for everyone, but it’s far from easy, considering even the very brightest minds on Wall Street have a difficult time doing it. It’s not only difficult to choose the winning funds, but it’s even more difficult to stay with the winning funds when they eventually have a rough period. AR: I like this line in the book “Investing really comes down to regret minimization.” This, in my mind, argues for the broad diversification possible. How do you see it? BC: Diversification is probably the best way to hedge your emotions and control for risk. But for all investors, no matter the strategy you employ, there are going to be trade-offs that you’re forced to deal with. Some investors can’t stand missing out on gains. Others can’t handle participating in large losses. Positioning your portfolio to minimize your greatest fear in the markets means you will be forced to give up on something. Risk never completely goes away. You can’t have it all. You can’t expect to make money in the markets without bearing risk in some form. Regret minimization is the process of knowing yourself and which risks you’re comfortable taking and which ones you would rather reduce. AR: I think you rightly note the advantages of hiring a competent financial advisor. However that does not let investors off the hook. What are some ways some one can, as you say “be a better client”? BC: While a good advisor has to set reasonable expectations for their clients, I think it’s also important for clients to have reasonable expectations for what their advisors can do for them. 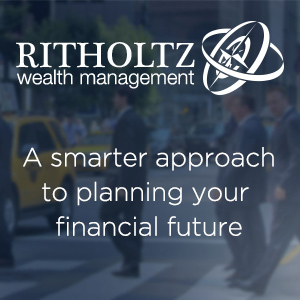 You can’t expect miracles from a financial advisor. Communication between the two parties is an overlooked aspect of a good long-term relationship, as well. No one knows their financial situation, emotional state or hope and dreams more than you, the client. A client is the biggest expert on their own situation and needs. A good advisor will help you figure out your needs, but you can’t simply sit back and do nothing. A good client should always be asking questions and paying attention to make sure the advisor is doing their job. One of the most important jobs a client has it to make sure that their advisors are doing what they said they were going to do at the outset of the relationship. You can read more about Ben’s book at Bloomberg Press or purchase it at Amazon. *Full disclosure alert: Ben has had some nice things to say about this blog and I earlier provided him a blurb for the book.